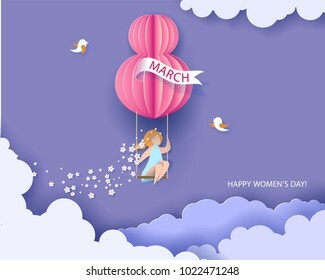 Vector illustration in rank M-rank: Card for 8 March womens day. Woman on swing. Abstract background with text and flowers .Vector illustration. Paper cut and craft style. Card for 8 March womens day. Woman on swing. Abstract background with text and flowers .Vector illustration. Paper cut and craft style.